The first Fête de la Musique took place in France on 21 June 1982 when between 8.30 pm and 9 pmmusicians, professionals and amateurs, came onto the streets in all the cities of France to play music. The event has enjoyed growing success year after year and has spread throughout Europe and indeed around the world. This year in France and in around 130 countries and over 340 cities the Festival of Music will be celebrated on or near to 21st June. In keeping with the spirit of La Fête de la Musique, Bal Feitste have scheduled an extra Bal to celebrate the arrival of summer! Bal - a time to practise the dances we have covered to date guidance will be given where necessary. 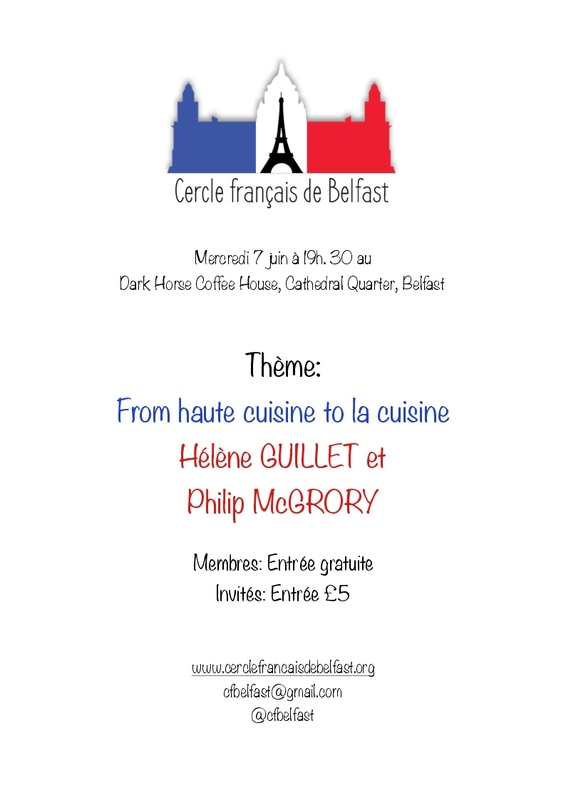 Hélène and Philip serve up a bi-lingual presentation in which they consider Haute Cuisine and its influence today in France and closer to home. As part of the Belfast Book Festival the Crescent Arts Centre welcomes Tariq Ramadan for a lecture and Q&A surrounding the ideas presented in his book Islam, The Essentials. Every few years France gets swept up in a controversy over Tariq Ramadan. Hardly a day goes by without the mention of Islam. And yet, for most people, and in much of the world, Islam remains a little-known religion. Whether the issue is violence, terrorism, women's rights or slavery, Muslims are today expected to provide answers and to justify what Islam is - or is not. But little opportunity exists, either in the media or in society as a whole, to describe Islam: precisely the question this short and extremely accessible book sets out to answer. Dr Tariq Ramadan is Professor of Contemporary Islamic Studies at Oxford University, President of the think tank European Muslim Network (EMN) in Brussels and a member of the International Union of Muslim Scholars. This event takes place in ..
on Thursday 8th June at 5:30pm. Tickets are £7 and £5 concession. Dance workshop - no experience or partner needed. This month a chance to learn to dance the Gavotte de Montagne.